Set in the breathtaking Swiss Alps, veteran actress Maria Enders (Juliette Binoche) prepares to star in the revival of a play that made her famous many years earlier. The role that catapulted her into stardom, that of Sigrid, a savvy vixen who engages in a power struggle with her older boss, Helena, will be played by troubled “it girl” Jo-Ann Ellis (a mesmerizing Chloë Grace Moretz). Enders will be taking on the role of Helena, one that she is not mentally prepared to play. With the help of her loyal assistant, Valentine (Kristen Stewart), Maria reluctantly faces the challenge head on, and in the process must come to grips with themes of aging—both in terms of the play and in her own life. 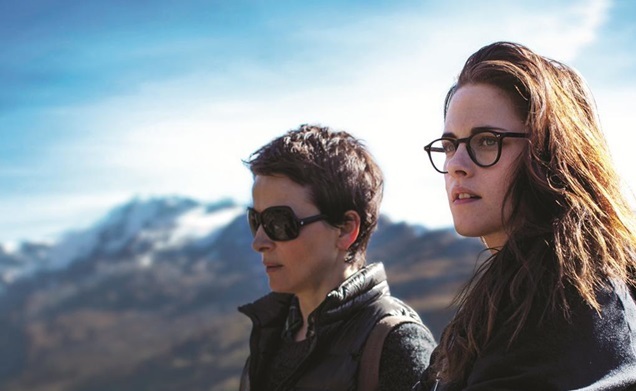 For Clouds of Sils Maria, famed French filmmaker Olivier Assayas reunites with Binoche following their 2008 family drama Summer Hours. In Clouds, Assayas draws parallels between the film’s main story and the play within the movie. Both explore the dichotomy between young and old, and the differing perspectives that come with each. Binoche shines as an aging actress who faces the impossibility of reclaiming her past self, and the struggle that often comes with an evolution of perspective. Valentine helps Maria along through her honesty and youthful outlook. The chemistry between Binoche and Stewart is undeniable. Each elevates the other to give her best possible performance in what is a rather weighty film with difficult topics. Following years performing in the Twilight film franchise, it’s sometimes difficult to recall that Stewart’s talent has more depth than some might know. She reminds audiences in Clouds that she is a serious actress capable of standing tall with classic veterans like Binoche and Assayas. And Binoche is quick to acknowledge this; recognizing the differences in her and Stewart’s processes, Binoche, who takes time to prepare for her roles, allowing the text and character to settle in, stated that Stewart approaches her preparation differently. Binoche said, “Our process is different because our rhythm is different. Kristen is quick because she has a seed of genius.” Naysayers may scoff at such a comment about the Twilight actress, but indeed, Stewart shines in Clouds with the radiance of an accomplished actor. Meanwhile, Binoche owns the camera in a way only an actor of her stature can. The 52nd New York Film Festival concluded on October 12, 2014. Follow Limité Senior Film Editor Daniel Quitério on Twitter (@dan_quiterio).